Limited edition of 100 (14.5" x 11") numbered and signed premium archival Giclee prints $125 CDN plus shipping. 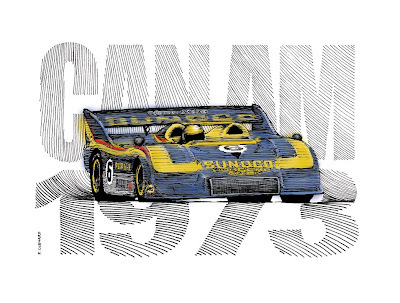 Roger Penske, Mark Donohue and Porsche made a formidable team in Can Am racing during the 1973 season. With Porsche's support, they modified the 917-10 into the all-dominating 917-30. The Donohue developped, Penske modified, Sunoco sponsored Porsche was said to put out over 1000 hp!